Top of the morning to all my friends out here on my side of the pond.....good evening to everyone on the other side. Its Saturday, what a wonderful day it looks like its going to be. To start off my weekend, I'm uploading a piece I completed yesterday. 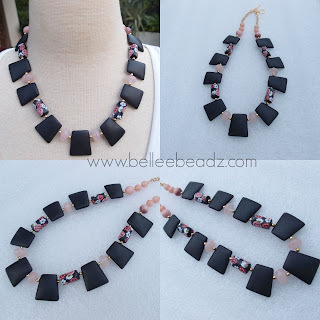 It features matte black onyx trapezoid beads 25mm x 20 mm at its broadest, equally gorgeous matte polymer clay tube beads approx 18mm x 10 mm, rose quartz smooth large rondells and ending with Peruvian pink opals, 10mm and 8mm. Necklace measures approx. 19.5"/49.5cm from end to end.